From the biblical Readings we have heard, I would like to draw three words: prayer, smallness, wisdom. Prayer. Today’s Gospel presents us Jesus Who prays. From His heart, these words flow: “I praise You, Father, Lord of heaven and earth, because You have hidden these things from the wise and learned, and revealed them to little children” (Mt 11: 25). Prayer comes from Jesus spontaneously, but it was not optional: he frequently retreated to deserted places to pray (cf. Mk 1: 35); dialogue with the Father was in first place. And the disciples discovered in this way, naturally, how important prayer was so that one day they asked Him: “Lord, teach us to pray” (Lk 11: 1). If we want to imitate Jesus, let us too begin where he started from, that is, from prayer. We can ask ourselves: do we Christians pray enough? Often, in the moment of prayer, many excuses come to mind, many urgent things to do… At times, then, we set prayer aside because we are caught up in an activism that becomes inconclusive when we forget “what is better” (Lk 10: 42), when one forgets that without Him we cannot do anything (cf. Jn 15: 5), and in this way we abandon prayer. Saint Pio, fifty years after he went to heaven, helps us because he wished to leave us the legacy of prayer. He recommended, “Pray a lot, my children, pray always, never tiring” (Words to the Second International Congress of Prayer Groups, 5 May 1966). Jesus in the Gospel also shows us how to pray. First of all, he says: “I praise you, Father”; He does not begin by saying, “I need this and that”, but, “I praise you”. One does not know the Father without opening oneself to praise, without devoting time to Him alone, without adoring. How we have forgotten the prayer of adoration, the prayer of praise! We must resume this. Each one of us can ask: how do I worship? When do I worship? When do I praise God? Resume the prayer of adoration and praise. It is the personal context, face to face, staying in silence before the Lord, the secret to entering ever more into communion with Him. Prayer can be born as a request, even for an urgent intervention, but it matures in prayer and adoration. Mature prayer. It then becomes truly personal, as for Jesus, who then engages freely in dialogue with the Father: “Yes, Father, for this is what you were pleased to do” (Mt 11: 26). And the, in free and trustful dialogue, prayer takes on all of life and takes it before God. And then we ask ourselves: do our prayers resemble that of Jesus, or are they reduced to occasional emergency calls? “I need this”, and so I pray straight away. And when you are not in need, what do you do? Or do we intend them as tranquilizers to take in regular doses, to have a little relief from stress? No, prayer is an act of love, of staying with God and taking to Him the life of the world: it is an indispensable work of spiritual mercy. And if we do not entrust our brothers and situations to the Lord, who will? Who will intercede, who will take care to knock on the heart of God to open the door to humanity in need? For this, Father Pio left us the prayer groups. He said to them, “It is prayer, this joined force of all good souls, that moves the world, that renews consciences … that heals the sick, that sanctifies work, that raises healthcare, that gives moral strength … that spreads God’s smile and blessing on every languor and weakness (ibid). Let us safeguard these words, and ask ourselves again: do I pray? And when I pray, do I know how to praise, do I know how to worship, do I know how to take my life, and that of all people, to God? Second word: smallness. In the Gospel, Jesus praises the Father because He revealed the mysteries of His Kingdom to the little ones. Who are these little ones, who know how to receive the secrets of God? The little ones are those who are in need of the great, who are not self-sufficient, who do not think that they need only themselves. The little are those who have a humble and open heart, poor and needy, who are aware of the need to pray, to entrust themselves and to let themselves be accompanied. The heart of these little ones is like an antenna: it captures the signal from God, immediately, they understand immediately. Because God seeks contact with all, but those who make themselves great create enormous interference, and the desire for God does not arrive when one is full of oneself, there is no room for God. This is why He prefers the little ones, He reveals Himself to them, and the way to encounter Him is that of stooping low, of shrinking inwardly, of acknowledging oneself as in need. The mystery of Jesus Christ is a mystery of smallness: He lowered Himself, He annihilated Himself. 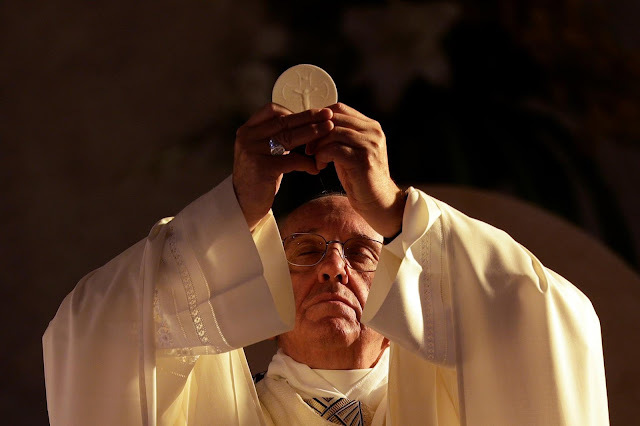 The mystery of Jesus, as we see in the Host at every Mass, is a mystery of smallness, of humble love, and can be grasped only by becoming small and frequenting the little ones. And now we can ask ourselves: do we know how to look for God where He is? Here there is a special shrine where He is present because there are many little ones preferred by Him. Saint Pio called it “a temple of prayer and science”, where all are called to be “reserves of love” for others (Address for the First Anniversary of the Inauguration, 5 May 1957): it is the House of Relief of Suffering. In the sick one finds Jesus, and in the loving care of those tending to the wounds of the neighbor, there is the way to meet Jesus. Those who take care of the little ones are on the side of God and defeat the culture of waste, which, on the contrary, prefers the powerful and deems the poor useless. Those who prefer the little ones proclaim a prophecy of life against the prophets of death of all time, even today, who discard people, discard children, the elderly, because they are not needed. As a child, at school, they taught us the history of the Spartans. I was always struck by what the teacher told us, that when a baby with malformations was born, they took him to the top of the mountain and threw him down so that these little ones would not exist. We children said: “But what cruelty!”. Brothers and sisters, we do the same, with more cruelty, with more science. What is not needed, what is not productive must be discarded. This is the culture of waste: the little ones are not wanted today. And this is why Jesus is set aside. Finally the third word, wisdom. In the first Reading, God says: “Let not a wise man boast of his wisdom and let not the mighty man boast of his might” (Jer 9: 23). True wisdom does not lie in having great qualities and true strength is not in power. Those who show themselves to be strong and those who respond to evil with evil are not wise. The only wise and invincible weapon is charity inspired by faith, because it has the power to disarm the forces of evil. Saint Pio fought evil throughout his life and fought it wisely, like the Lord: with humility, with obedience, with the cross, offering pain for love. And everyone admired him, but few do likewise. Many speak well, but how many imitate? Many are willing to put a “like” on the page of the great saints, but who does as they do? Because the Christian life is not a “like”, it is a “gift” to me. Life is perfumed when it is offered as a gift; it becomes insipid when it is kept for oneself. And in the first Reading God also explains where to draw the wisdom of life: “Let the one who boasts boast about this: that they have the understanding to know me” (v. 23). To know Him, that is to meet Him, as God Who saves and forgives: this is the way of wisdom. In the Gospel, Jesus reaffirms: “Come to me, all you who are weary and burdened” (Mt 11:28). Which of us can feel excluded from the invitation? Who can say, “I do not need it”? Saint Pio offered his life and innumerable sufferings to enable his brothers to meet the Lord. And the decisive way of meeting Him was Confession, the sacrament of Reconciliation. There, a wise life begins and starts over, loved and forgiven; there begins the healing of the heart. Father Pio was an apostle of the confessional. Today too he invites us there; and he says to us: “Where are you going? To Jesus or to your sadness? Where do you return? To He Who saves you or, in to your defeats, your regrets, your sins? Come, come, the Lord is waiting for you. Take courage, there is no reason so grave as to exclude you from His mercy”. The prayer groups, the sick of the House of Relief, the confessional: three visible signs that remind us of three valuable legacies: prayer, smallness and the wisdom of life. Let us ask for the grace to cultivate them every day.